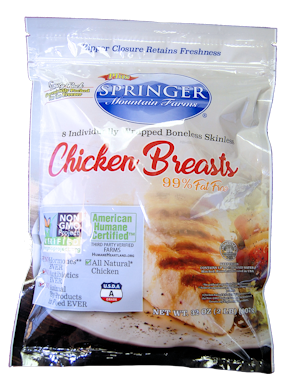 Springer Mountain Farms Frozen Individually Wrapped 4 oz. Boneless Breast Fillets are individually vacuum-packed, sealed and flash frozen to lock in freshness. They are trimmed and perfectly portioned at 4 oz. for a slightly smaller serving, making them convenient for a light meal or snack. The resealable outer bag allows you to cook as many, or as few, as you need at one time. -Average weight per bag: 2.0 lbs.